Start by undertaking an elimination diet. This is a vital step to stabilize and sooth the digestive tract. Eliminate known foods that commonly cause allergies, sensitivities, and intolerances such as gluten, dairy, eggs, soy, and sugar. An elimination diet involves removing potential symptom causing foods for a period of time and strategically introducing them back in in hopes of identifying the food culprit. Sensitivities differ from allergies and intolerances. Unlike allergies and intolerances, sensitivities may vary from in different situations; allergies and intolerances, however, will always produce the same reaction. Sensitivities are caused by the body’s inability to process specific substances and an activation of the immune system which may cause leaky gut, bloating, fatigue, headaches and chronic inflammation. Food sensitivity symptoms can be very difficult to identify and link to foods, environmental triggers, and food additives because reactions to can be delayed by hours or days. Some sensitivities even manifest symptoms up to 72 hours after the encounter! There is also a difference in the amounts of exposure each person can tolerate, meaning the “dose makes the poison." For instance, you may eat one serving of a food and experience no reaction, but when you eat large quantities or consume something consistently over time, unpleasant symptoms may occur. Exploring a food sensitivity test is a great way to take the guesswork out of elimination diets and helps to isolate exactly what your body is creating an immune response to which further exacerbates inflammation. The test used in my practice is the Oxford Biomedical LEAP MRT Test. It looks at 170 different foods and chemicals and reports which foods, chemicals (both man-made and naturally occurring) causes your body inflammation. It is essentially a very personalized anti-inflammatory diet based on your chemical composition. Undergoing a stool analysis is an excellent way to determine what is going on in your gastrointestinal tract. Identification of overgrown pathogenic yeast, bacteria, parasites, and viruses is a crucial step in optimizing gut health. While one may not always be symptomatic of bacterial imbalances, chances are you have been on antibiotics and are exposed to them through other ways, such as through diet, that could have negative implication on your bacterial balance. When the “good guys” are lowered and defenses are down, that opens the door for the “bad guys” to proliferate and take over. When that happens, it is bad news! A stool test can also help to identify inflammation in the gastrointestinal tract that can decrease the ability of your gut to absorb nutrients properly and may lead a practitioner to adjust your supplementation. Additionally, looking at a sample of stool can determine if you are secreting enough digestive juices to break down food and supplements properly, which can also be remedied through dietary and enzymatic therapy. And, finally, it can determine if you have adequate immune-mucous layers in the GI tract and/or if you have gluten related inflammation. This component of gut repair includes replacing biological compounds that may be missing during the digestion process. 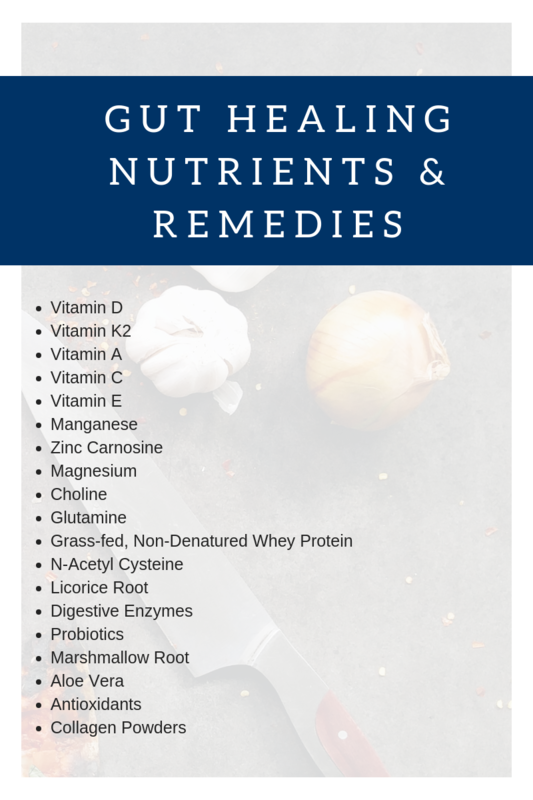 This includes digestive enzymes like lipases (to break down fat), proteases (to aid in digestion of proteins), amylase (for carbohydrate metabolism), and other necessary and naturally occurring chemicals. These can become depleted when the body is experiencing too much stress, whether physical or mental, as we shift in an out of “fight or flight” instead of “rest, digest, reproduce." Depletion can also occur as a side effect of not utilizing a specific nutrient which results in the body producing less in a case of “use it or lose it." A few good examples here include the decreases in lactase enzymes to break down the sugar in milk as babies grow. In some people, this decrease in lactase production results in lactose intolerance in later years as the body becomes unable to digest lactose. Another example includes recovering vegans and vegetarians who do not tolerate the introduction of animal proteins as there have been changes in stomach acidity and protease secretion. Taking a digestive enzyme supplement with meals is beneficial in these situations while the body becomes retrained to the “new normal” and stress levels are better managed. Optimizing nutrient status is vitally important to a successful conception and pregnancy. As dysbiosis and intestinal inflammation persist, the body’s capacity to absorb, utilize, and distribute nutrients throughout the body is diminished, thus increasing the demand for certain nutrients. Replacement of these nutrients through dietary and supplementalsources is beneficial while the integrity of the gastrointestinal tract is improved. Probiotics, or good gut bacteria, also need to be replaced if levels are not optimal. The gastrointestinal tracts houses bacteria, yeast, and viruses that are both good and bad. These microorganisms make up the “microbiome” and are important for immunity, digestion, and keeping us healthy in general. In today’s society, we are bombarded with antibiotics through medications and the food supply. Exposure to antibiotics can alter the delicate balance of good versus bad bacteria which can set the stage for opportunistic to overpopulate the healthy bacteria. When this happens, the integrity of our gastrointestinal tract is compromised. Therefore, it is wise to repopulate good bacteria through routine consumption of probiotic rich foods such as sauerkraut, kimchi, whole-milk kefir and yogurts, and other fermented foods. Additionally, a full-spectrum probiotic taken before bed on an empty stomach is usually well tolerated and is a good option for general health and wellness. The gold standard, however, is to have an analysis on your stool to identify areas of imbalance and have a more targeted and individualized approach to probiotic therapy. Depending on your medical history and current state of health, consider working alongside Nicole to find the combination that works best for you. 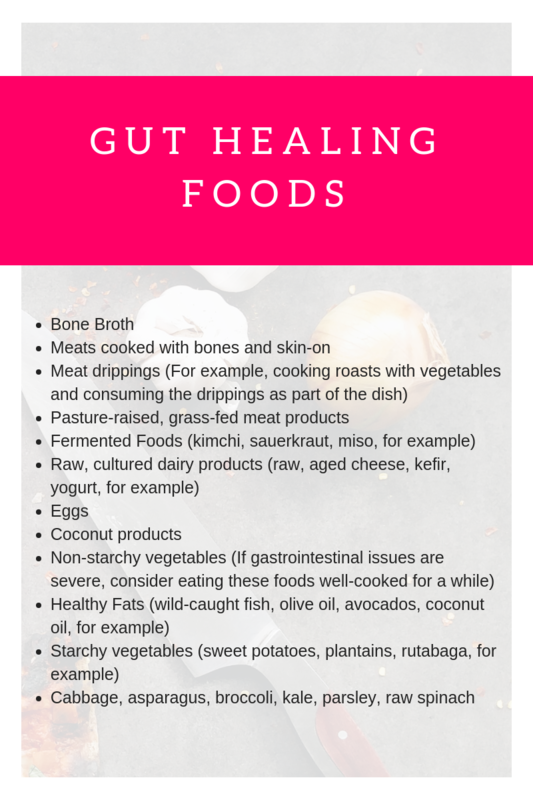 Incorporating vitamins, minerals, supplements and therapeutic foods has been shown to heal the gut by providing the necessary building blocks the body needs to regenerate tissue, cells, and immune layers. Managing stress is critical to preventing digestive problems from recurring. Consistently elevated stress levels negatively impacts hormones and can impair digestive health. Incorporate some form of stress management like deep breathing, a walk around the neighborhood, or meditation. Sleep also plays a vital role in our body’s repair mechanisms. Aim for 7-9 hours per night. If you’re a night owl, try to go to bed 10 minutes earlier each week. NOTE: The above are listed as general nutrient components that may help the management of your gastrointestal issues. These are not listed as recommendations and should not be taken without the advisement of your doctor and professional medical personnel. It is highly suggested that you get your micronutrient levels tested to ensure adequate dosages as well as appropriate combinations of supplement therapies.